Draft Before Damage: Not reported. 1. On 6 April 1945, NEWCOMB was serving as part of the screen for ST. LOUIS in support of minesweeping operations near Okinawa. Upon completion of this duty and while proceeding to rendezvous with a night retirement group, NEWCOMB was subjected to a concerted attack by seven Kamikaze aircraft. At 1800, one plane crashed into the after stack, putting the after fireroom out of operation and causing a fire in the upper handling room of 5" mount 3. Shortly thereafter, a second plane, carrying a bomb, crashed amidships in the vicinity of the torpedo workshop. 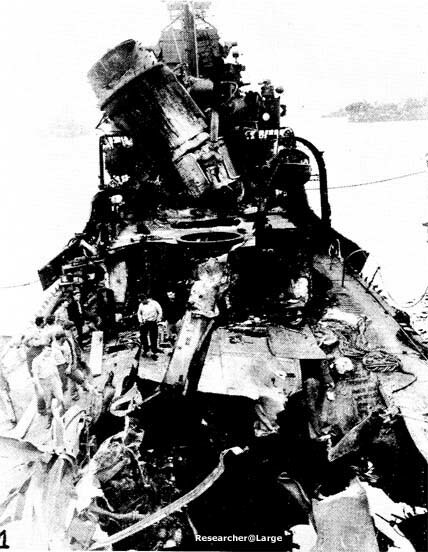 The explosion of this bomb caused serious damage to both engine rooms, completely immobilizing the ship. 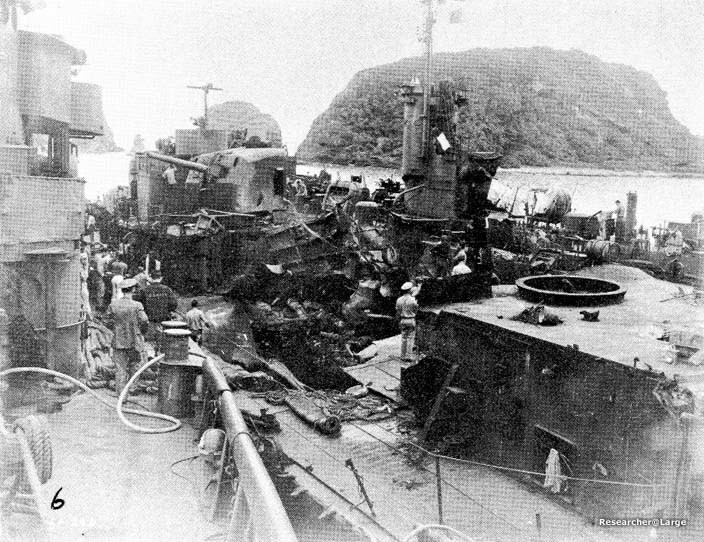 The after stack, both torpedo mounts, amidship superstructure, 40 mm mounts and magazines were blown over the side (Photos 50 and 51). The main deck was ruptured between frames 108 and 135, the starboard side being blown upward and the port side downward. A fire raged throughout the after deckhouse and in the amidship area. A third plane crashed into the forward stack and added gasoline to the amidship fire. At 1811, LEUTZE came alongside to assist in firefighting. At 1815, anti-aircraft fire caused a fourth plane to swerve from its course toward the bridge and to crash amidships and cross to LEUTZE's fantail where it exploded. At 1830, BEALE came alongside and passed over fire hoses. All fires were under control by 1900 and at 1930 all fires were extinguished. (a) The keel buckled at frame 120 over a length of two feet and projecting about six inches below the base line. (b) A 5' x 2 1/2' hole at frame 119, six feet to port of centerline. (c) Two 12" x 18" holes at frame 120 and 121, five and six feet to starboard of centerline. (d) A 1' x 1' hole at frame 118, six feet to port of centerline. (e) An 8" diameter hole at frame 119, one foot to port of centerline. (f) A 6" diameter hole at frame 123,	one foot to starboard of centerline. (g) Numerous small projections of plating near frame 120. (h) Leaking shell plating seams, frames 120 to 130. 3. The shell plating was slightly distorted on both sides between frames 100 and 140, the maximum being 6" at frame 120. Bulkheads 110 and 131 1/2 were destroyed so that B-2, B-3-1 and B-4 flooded to the waterline. 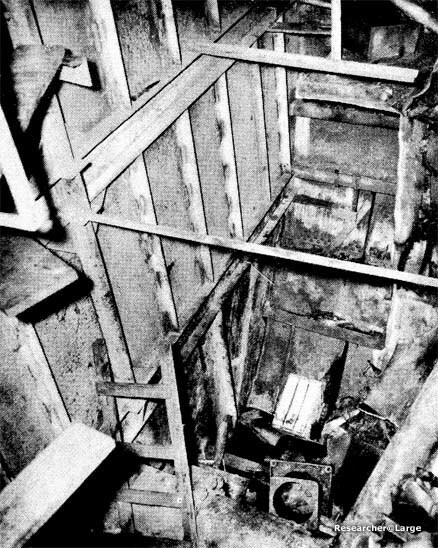 Bulkhead 92 1/2 was seriously bulged and damaged, but was intact to within five feet of the main deck, so that there was only minor leakage into B-1-1. (a) All holes in shell plating were covered over with 15# plate. 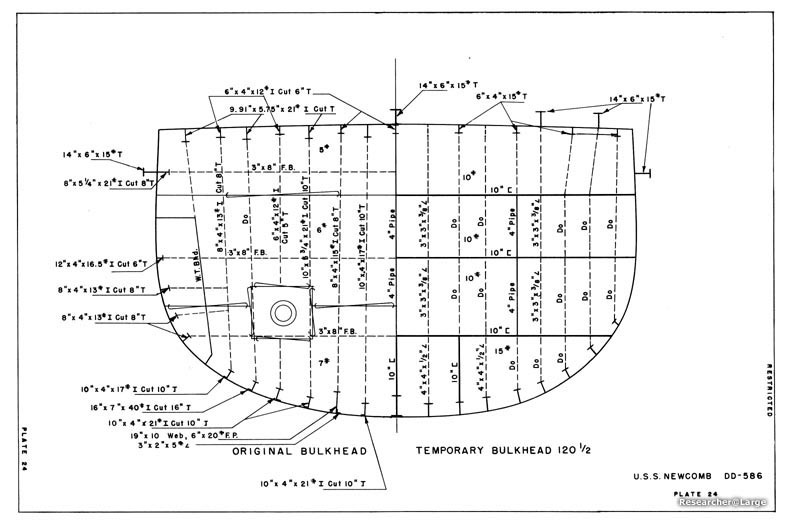 (b) All shell suction and discharge lines in B-2, B-3-1, and B-4 were blanked. 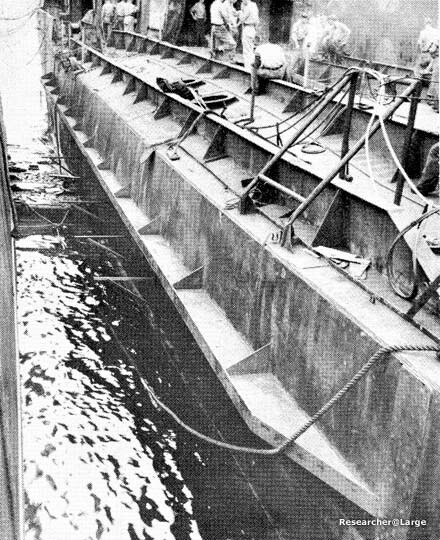 (a) A temporary transverse bulkhead was installed at frame 120 (Plate 24, Photo 52). (b) 15# plate was used to repair web frames 130 and 133, port, and web frames 133 and 136, starboard. (c) The longitudinals under the missing portion of the deck were replaced by T's built up from 15# plate. (d) The missing center portions of 9 web frames in way of the main deck were replaced by 10" channels (Plates 25 and 26). (e) The port and starboard sheer strakes were reinforced by 14"/6" x 15#,15# T's (Photo Photo 55). Photo 50: NEWCOMB (DD 586) Looking forward at damaged area. Photo 51: NEWCOMB (DD 586) Looking aft and to port at damaged area. Photo 52: NEWCOMB (DD 586) After side, starboard, of temporary bulkhead 120-1/2. 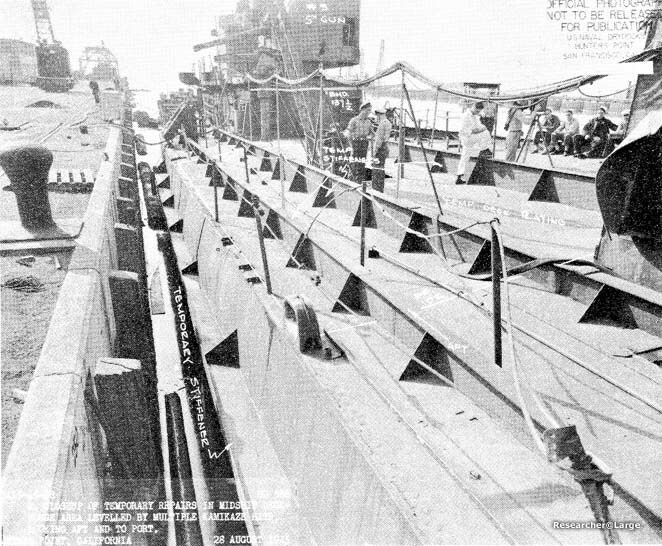 Photo 53: NEWCOMB (DD 586) Looking at forward end of replacement main deck plating. 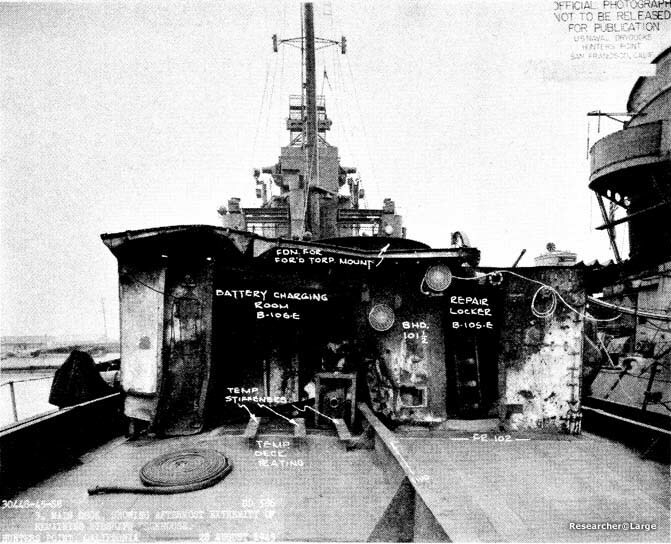 Photo 54: NEWCOMB (DD 586) Looking aft along starboard side showing T stiffeners on shell and deck plating and outline of replacement deck plating. Photo 55: NEWCOMB (DD 586) Looking forward along port side at T stiffeners installed on shell and deck plating.